Following multiple speculations and endless spy pictures, the Volkswagen T-Cross has finally come alive in production form. 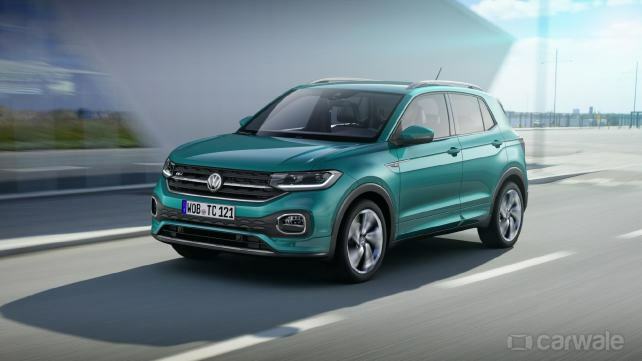 The premium SUV was recently unveiled in Amsterdam and is the smallest offering in VW’s line of SUVs including the Tiguan, T-Roc and the flagship Touareg. Here’s a deeper look into this rather important model that’s headed our way. Based on the same MQB-A0 platform as the new-gen Polo, the T-Cross is 4.2m long, 1.76m in width and 1.56m in height. Volkswagen says the T-Cross will have a host of customisation options with no less than 12 colour variants to choose from. It will also have an equal number of interior personalisation options just like the new-gen Polo. Upfront, the horizontal grille gets full-width louvres that elongate all the way to the headlamp which is, in fact, akin to the T-Roc. The front bumper gets integrated fog lamps in a black insert. But the most interesting part of the T-Roc is the dual tone multi-spoke alloy wheels which can also be matched with the body colour for added personalisation. What catches your attention in profile are the sharp creases and prominent wheel arches. The T-Cross is compact yet spacious according to Volkswagen. At the rear, the tail lamps are joined by black inserts that run along the tailgate. The LED tail lights are unique and match the character of the SUV. VW has also confirmed a boot size of 455-litres which can be expanded to 1,281litres with the 60:40 seats folded down. Inside there is a fully digital cockpit. The centre console has an eight-inch touchscreen infotainment system with all the connectivity features expected in modern day cars. As mentioned earlier, there will be a choice of 12 interior colours which will dominate on the dashboard and all around the cabin. Under the hood, the new T-Cross will have a choice of four turbocharged engines: three petrol and one diesel. The two 1.0 TSI three-cylinder petrol engines with petrol generating 95bhp or 115bhp. The top model is the 1.5 TSI four-cylinder engine with 150bhp. Completing the range is a 1.6 TDI four-cylinder engine with 95bhp. All engines comply with the latest Euro 6d-TEMP emission standard.